As a general rule of thumb, it’s more important for your socks to match in a formal setting. If you’re wearing a dark suit (navy, charcoal, black), then your socks should also be dark to create a smooth visual line from your trousers to your shoes. If you want to play it safe, match your socks to your suit color to blend in with the rest of your outfit. It is also appropriate to experiment with subtle patterns, prints, or various dark colors—extra points if your socks bring together colors from your shirt or tie. If you are at a wedding or laidback occasion, you might want to consider wearing socks as a statement piece (stripes, bold colors, loud patterns), but tread carefully here, you don’t want your socks drawing negative attention. Stylist tip: Be sure your suit socks are long enough to cover any leg that might show when you sit and cross your leg. While your plain white gym socks can work with jeans, sneakers, and a sweatshirt, why not have some fun and elevate your sock game? 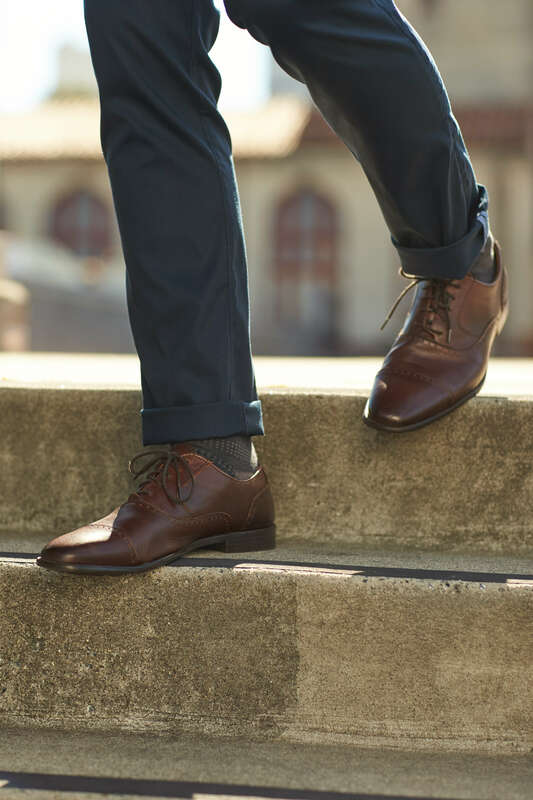 Socks are easy way to add depth and personality to your outfit, especially if you are a fan of cuffing your pants. Again, it’s always a good idea to pull from colors in your outfit to coordinate, but feel free to step it up with creative prints, patterns, and textures. Wearing a pair of casual denim jeans gives you a lot of leeway, so take advantage and experiment with your sock style. With so many options available, there are a ton of ways to elevate your sock game and create a whole new meaning for the definition of matching.